Poly-Control will reduce the price of its Danalock (Bluetooth edition) to $129 starting February 15. 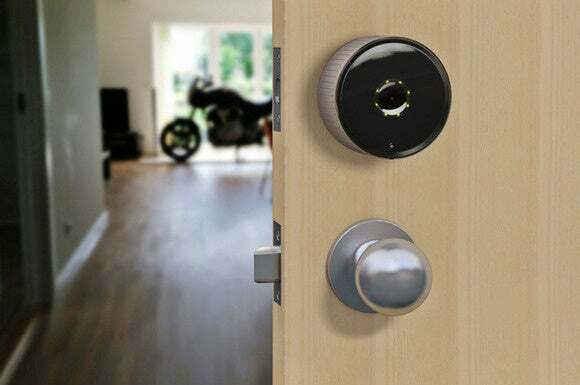 The typical smart deadbolt costs $200 or more and replaces the entire lock mechanism. Poly-Control's Danalock costs much less because it replaces only the thumb-latch on the interior side of the door. A motor engages and turns the existing lock's tail-piece, which in turn slides the deadbolt in and out. This concept has enabled Poly-Control to sell the Danalock for $179, but the company announced a six-week promotion at CES that slashes the price of the Bluetooth version of the lock to just $129, and the Bluetooth plus either ZigBee or Z-Wave to $149 starting February 15. Poly-Control is also previewing several other new products at CES this year: The $69 Danapad is a numeric keypad that can be mounted outside the door or on an adjoining wall (up to six feet away). This eliminates the need for a smartphone to unlock the door, users just type in the access code. The $49 Danafob makes for a keyless entry system similar to what you might have for your car. If you have an old unused smartphone or tablet, install the free (coming soon) Danabridge app on it and you'll be able to remotely lock and unlock the Danalock via the Internet. The app will use an Android or iOS device as a Wi-Fi-to-Bluetooth bridge. Finally, Poly-Control is also showing the Danalock Garage, a battery-powered device that will enable you to open and close your garage door using your smartphone. It will also send notifications when the door is operated, and log activity. Editors note: An earlier version of this story inferred in error that the price cut promotion started at CES: the promotion actually starts February 15 and runs for six weeks after that date.